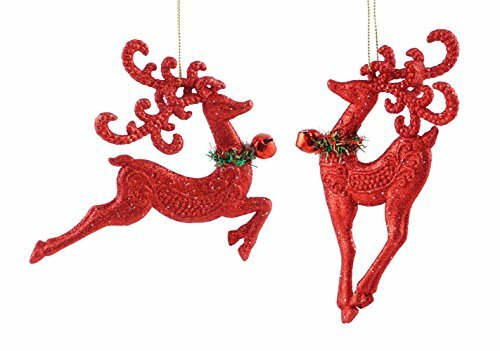 Our glittery reindeer ornaments are elegant yet traditional & will always be in style for years to come! Features a set of glittery red prancing reindeer, wearing tinsel collars that have red jingle bells - Measures approx. 3.25"-5"W x 4"-4.75"H. Comes with string attached for hanging. Celebrate the season with these beautiful & elegant designed ornaments! Celebrate the season with these beautiful & elegant designed ornaments!